Aquasalt® the purest salt available for swimming pool and spa chlorine generators. Not intended for human consumption. 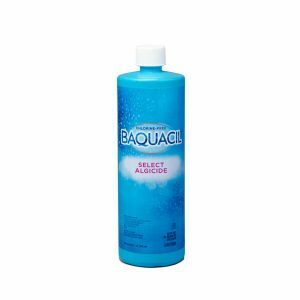 The principle chemical in the BAQUACIL® Pool Care System is a chlorine-free liquid sanitizer that provides safe, consistent control of bacteria and algae. It has a long shelf life, is highly stable in water and lasts longer than chlorine without any of chlorine’s unpleasant side effects. A specially formulated product that is designed to maintain a residual BAQUACIL® Oxidizer level in pool water for clear water all season long. Step 3 in the 3-Step BAQUACIL® CDX® System. Easy to use, accurate test strips that measure pH, total alkalinity, BAQUACIL® Sanitizer and Algistat and BAQUACIL® Oxidizer. One dip gives fast results within 15 seconds. Test weekly for water clarity throughout the summer. Use with BAQUACIL® CDX™ System. A liquid algaecide that’s proven effective against a wide range of slime and algae, including common types. BAQUACIL® Select Algicide offers long-lasting protection from green, yellow and black algae. It kills algae and clears pool water. It’s also effective in a wide range of pH levels and can be used on all pool surfaces.